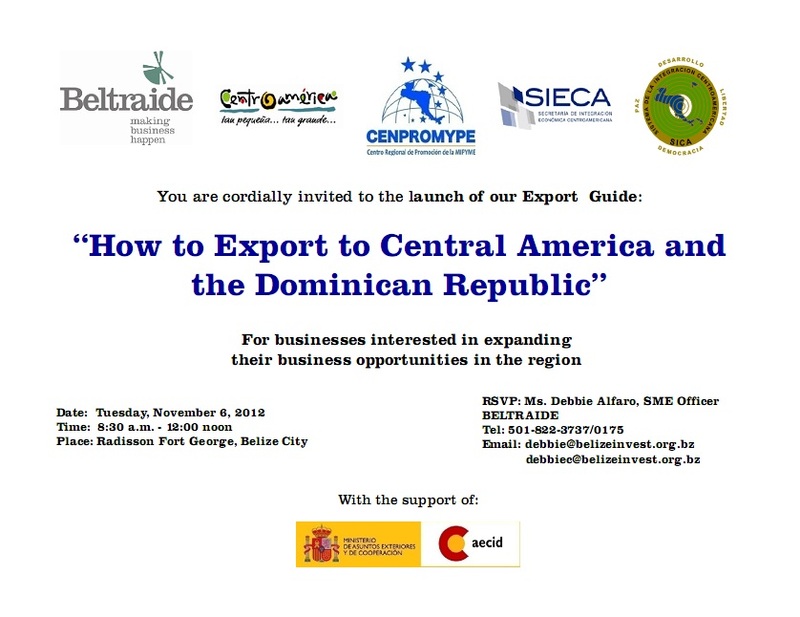 As a result of the Market Access Regional Program, implemented through the Regional Centre for the Promotion of Micro and Small Enterprises in Central America and the Dominican Republic (CENPROMYPE) and the Belize Trade and Investment Development Service (BELTRAIDE), the toolkit “Exporting to Central America and the Dominican Republic” will be launched on November 6th, 2012 from 8:30am – 12:00pm, at Radisson Fort George Hotel & Marina. This program is funded by SICA Spain through the Spanish Agency for International Cooperation for Development (AECID). This initiative seeks to promote regional trade as an opportunity to promote economic development so that the market is consolidated as a promotional space, to increase interdependence and opportunities for stakeholders in the region, including, governments, businesses and workers. The recent signing of the Association Agreement between Central America and the European Union generates a lot of expectations, enhancing the opportunity to finalize negotiations, leading to the establishment of the Customs Union for the region. Furthermore, the Micro, Small and Medium Sized Enterprises (MSMEs) represent a large percentage of the economic structure of Central America; so, many countries have initiated the design and implementation of policies aimed at this sector. In this context the toolkit “Practical Guide to Exporting to Central America and the Dominican Republic” will be presented, aiming to contribute to the process of internalization of MSMEs in the regional market. It will also aim to be a tool to facilitate access to information. The specifics of the guide are dimensioned to sectors considered relevant in most of the countries of the region: food (dairy, jams and compotes), handicrafts (wood, furniture and textile crafts) and supplements (fortified) food.